When we speak about the senses we usually mean the five traditional senses, but even a slight acquaintance with the scientific research on sense perception tells us that the simplest questions about the senses are currently open questions. What is here meant by the simplest questions are how many we have and how they should be counted. If there are no good answers to these basic questions, or at least a fairly broad agreement on how to proceed, then we don�t really even know what a sense is. Until recently there was little concern about the senses in philosophical discussions and when they needed to be mentioned the old list of five was offered or, more simply, vision was enlisted as a paradigm of all perceiving and the problems of vision tended to be discussed as if everything said applied across the whole sensory range. This is easily checked and there is no need to go into examples. It is fair to say that this substitution of vision for perception is not always incautious or misleading, but it has been very widespread. All this is now changing. 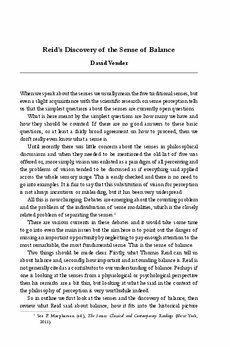 Debates are emerging about the counting problem and the problem of the individuation of sense modalities, which is the closely related problem of separating the senses. There are various currents in these debates and it would take some time to go into even the main issues but the aim here is to point out the danger of missing an important opportunity by neglecting to pay enough attention to the most remarkable, the most fundamental sense. This is the sense of balance. Two things should be made clear. Firstly, what Thomas Reid can tell us about balance and, secondly, how important and astounding balance is. Reid is not generally cited as a contributor to our understanding of balance. Perhaps if one is looking at the senses from a physiological or psychological perspective then his remarks are a bit thin, but looking at what he said in the context of the philosophy of perception is very worthwhile indeed. So in outline we first look at the senses and the discovery of balance, then review what Reid said about balance, how it fits into the historical picture with some of the comments about balance in the current debate about the senses. There are some peculiar things said about it and Reid can be asked to help us sort out some of the muddles. Finally, a suggestion or hint from Reid will be taken up in order to show that the point about balance being the most fundamental sense � maybe it is better to say that it is foundational for all perception � is not just grandstanding. This will be illustrated by a few empirical results from the scientists looking at balance.